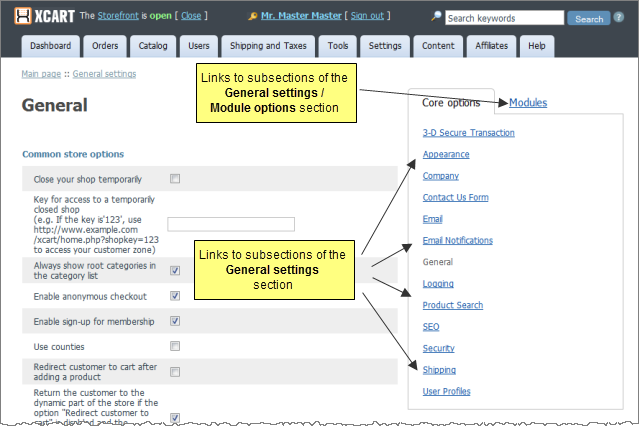 You can adjust the overall configuration of your store using the 'General settings' section of X-Cart Admin area. In X-Cart versions 4.3.0 and later, the 'General settings' section can be found at Settings menu -> General settings; in earlier X-Cart versions, this page can be found at Administration menu -> General settings. The 'General settings' section allows you to access and control both the settings affecting X-Cart's core functionality and the settings of X-Cart's modules. 3D-Secure Transaction options: This page allows you to enable Cardinal Centinel® payment authentication platform support in your store. Appearance Options: This page allows you to adjust preferences that affect the overall appearance of your store. Company options: This page allows you to provide your company details and contact information (name, address, phone/fax numbers, email addresses, etc). Your company name, address and phone/fax numbers will be displayed on the storefront and included into customer email notifications. Email addresses of specific departments of your store will be used by X-Cart to send administrator and provider notifications. Company address will be used in real-time shipping rate calculations. Contact us form options: This page allows you to configure the 'Contact us' form. You can define, which of the 'Contact us' form fields should be active (visible to customers), and completion of which fields should be required (mandatory). If necessary, you can also add your own (custom) fields to the 'Contact us' form. Email options: This page allows you to define options that affect sending of email notifications and newsletters. Email notifications options: This page allows you to define, which of the available email notifications should be sent to the customers, administrator(s), provider(s), users department and orders department of your store. General options: This page allows you to adjust the general configuration of your store. Logging options allows you to define what kind of logs you wish to be kept in your store. Product search options: This page allows you to define, which fields should be included into the Product search form in the Customer area, and set default values for these fields. SEO options: This page allows you to adjust options that can improve your site's ranking with search engines. Security options: This page allows you to adjust options that affect your store security (options that affect encryption methods used in your store, HTTPS options, etc). Shipping options: This page allows you to adjust options that affect the calculation of shipping rates in your store. User Profiles options: This page allows you to configure your store's user profile forms. You can define which of the user profile fields should be active (included into the user profile forms), and completion of which fields should be required (mandatory). If necessary, you can also add your own (custom) fields for use in user profiles. Information on the settings pages pertaining to X-Cart modules is available in the Modules section of this manual. This page was last edited on 30 July 2012, at 12:10.